DOUBLE PICTURE MOUNTS TO BUY ONLINE. 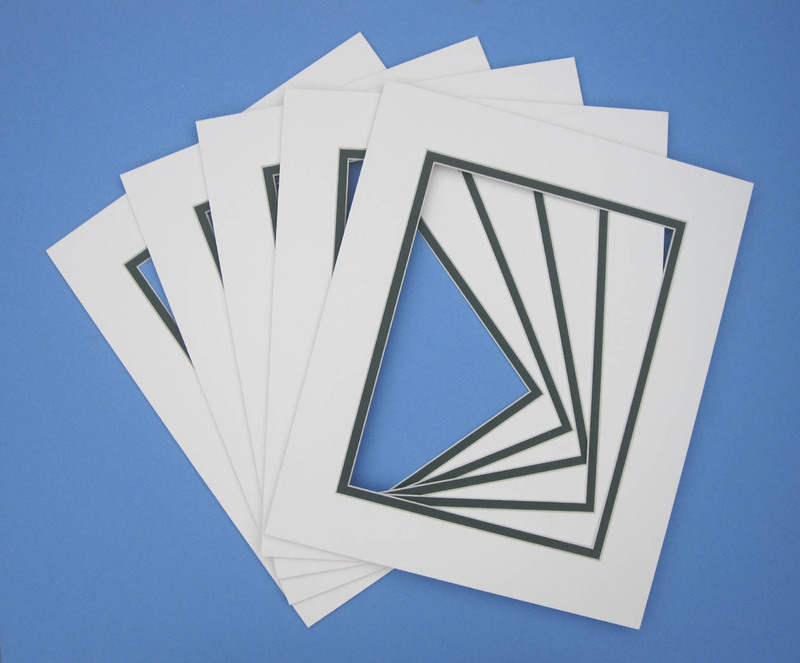 All our picture mounts are cut in white core acid free mountboard to better protect your artwork. All our picture mounts come with a standard aperture but can be cut to any size at no extra cost. All our Double Mounts come with a Soft White outer mount and the undermount can be cut in any of the colours below so please specify the aperture size and undermount colour via email when ordering.Please note image colours may vary slightly on different monitors. CLICK ON ANY IMAGE TO ENLARGE. The colours are from left to right, Burgundy, Bottle green, Maple green, Light blue, Black, Soft white. 20X16inch DOUBLE PICTURE MOUNTS X5. Acid free white core mountboard. Mounts come with a 16"x12" aperture but can be cut to any aperture size on request.Please specify the aperture size and undermount colour via email when ordering. Price £22.50 inclusive of postage. 16X12inch DOUBLE PICTURE MOUNTS X5. Acid free white core mountboard. Mounts come with a 11 1/2"x8" aperture but can be cut to any aperture size on request.Please specify the aperture size and undermount colour via email when ordering. Price £19.20 inclusive of postage. 14X11inch DOUBLE PICTURE MOUNTS X5. Acid free white core mountboard. Mounts come with a 9 3/4"x6 3/4" aperture but can be cut to any aperture size on request.Please specify the aperture size and undermount colour via email when ordering. 12X10inch DOUBLE PICTURE MOUNTS X5. Acid free white core mountboard. Mounts come with a 9"x7" aperture but can be cut to any aperture size on request.Please specify the aperture size and undermount colour via email when ordering. Price £13.50 inclusive of postage. 10X8inch DOUBLE PICTURE MOUNTS X8. Acid free white core mountboard. Mounts come with a 7 1/2"x5 1/2" aperture but can be cut to any aperture size on request.Please specify the aperture size and undermount colour via email when ordering. 9X7inch DOUBLE PICTURE MOUNTS X8. Acid free white core mountboard. Mounts come with a 6 1/2"x4 1/2" aperture but can be cut to any aperture size on request.Please specify the aperture size and undermount colour via email when ordering. 8X6inch DOUBLE PICTURE MOUNTS X10. Acid free white core mountboard. Mounts come with a 5 3/4"x3 3/4" aperture but can be cut to any aperture size on request.Please specify the aperture size and undermount colour via email when ordering. 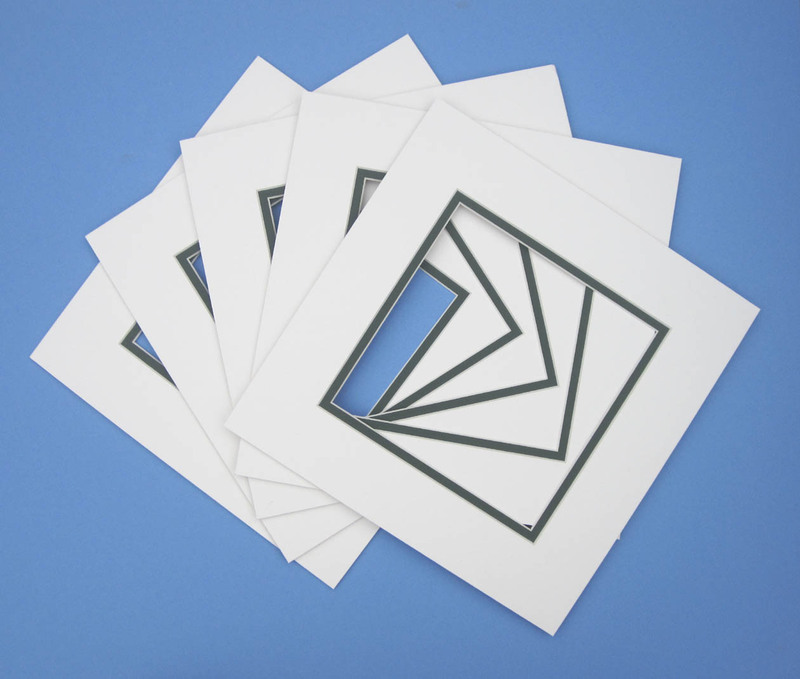 7X5inch DOUBLE PICTURE MOUNTS X10. Acid free white core mountboard. Mounts come with a 5"x3" aperture but can be cut to any aperture size on request.Please specify the aperture size and undermount colour via email when ordering. 12X12inch DOUBLE PICTURE MOUNTS X5. Acid free white core mountboard. Mounts come with a 8 1/2"x8 1/2" aperture but can be cut to any aperture size on request.Please specify the aperture size and undermount colour via email when ordering. Price £14.70 inclusive of postage. 10X10inch DOUBLE PICTURE MOUNTS X5. Acid free white core mountboard. Mounts come with a 7 3/4"x7 3/4" aperture but can be cut to any aperture size on request.Please specify the aperture size and undermount colour via email when ordering. 8X8inch DOUBLE PICTURE MOUNTS X10. Acid free white core mountboard. Mounts come with a 5 1/2"x5 1/2" aperture but can be cut to any aperture size on request.Please specify the aperture size and undermount colour via email when ordering. Price £11.90 inclusive of postage. 6X6inch DOUBLE PICTURE MOUNTS X10. Acid free white core mountboard. Mounts come with a 3 3/4"x3 3/4" aperture but can be cut to any aperture size on request.Please specify the aperture size and undermount colour via email when ordering.